This week we started a Summer Bar Essentials topic. Last time we talked about cocktails and recommended a few bar pieces for making and experimenting with these refreshing drinks. This article is dedicated to food. You’ll find different items that will help you in the kitchen and speed up the food making process. Less time preparing, more time eating and enjoying the weather. Whether you’re making eggs, pancakes or baking a summer fruit pie, Nest Homeware has you covered. 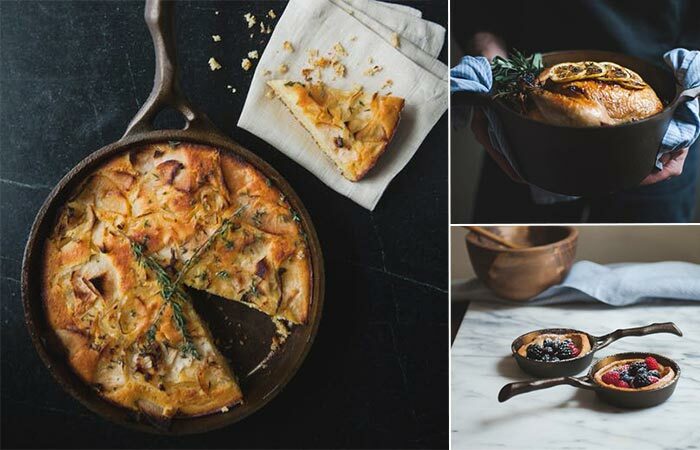 This company from Rhode Island makes cast iron cookware that will last you a lifetime. What all of the pieces have in common are the smooth cooking surface and the fact that they are very light. The skillet is seasoned with flaxseed oil and comes with or without the lid. There’s also a cast iron Dutch oven that can be used for preparing large family meals as well as the small egg pan for baking smaller pies, making compotes, spices, and sides and of course, breakfast eggs. 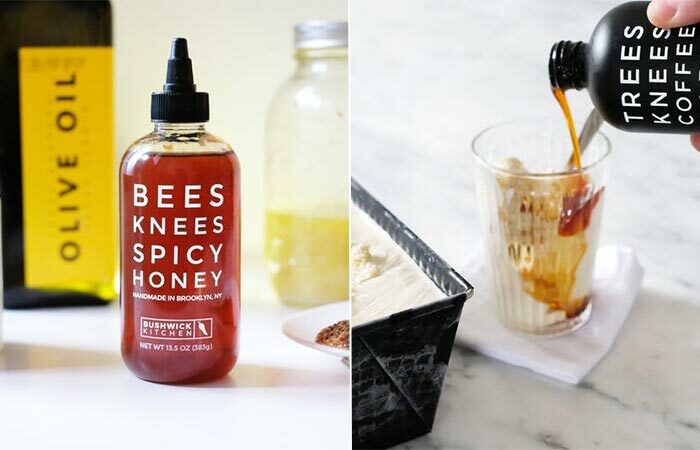 Bushwick Kitchen is a company from Brooklyn that makes homemade syrups. There are three basic types- spicy, honey and maple, each one with several tastes. The company became popular thanks to their delicious and now famous Weak Knees Gochujang Sriracha but they continue to impress. You can add the syrups to every meal, whether it’s breakfast or dessert. The spicy collection is perfect for pasta, meat, and breakfast sandwiches, while honey and maple flavors can be added to ice cream, pancakes and baked pies. Crafted from Carrara marble (one of the rarest marbles in the world) and waterjet cut, The Palate Serving Tray is your next bar centerpiece. It’s luxurious and very elegant. Besides the marble, the tray features CNC carved American Walnut handles that are specially designed for easy transport. 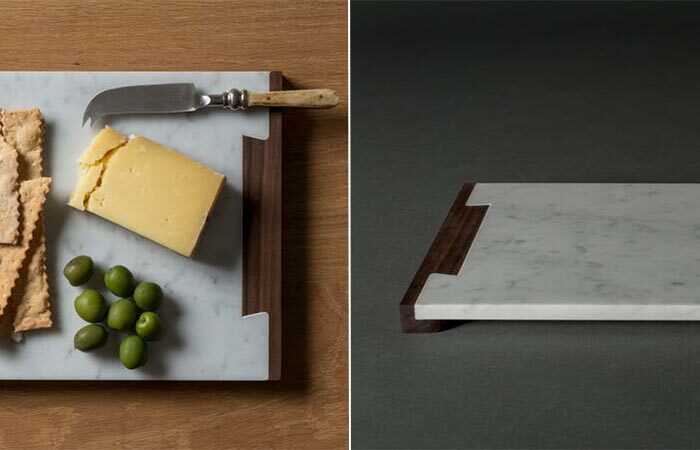 This tray is perfect for serving cheese and sushi. This is a company we featured several times and we have a good reason for it- their products are useful and well designed. Today we are mentioning three food related items that we never wrote about but deserve a mention for sure. Let us start with the Buenos Nachos book. 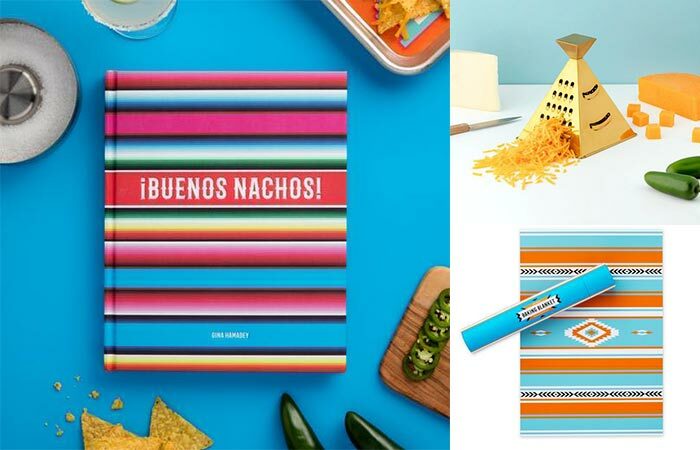 Just like the name says, this book is all about nachos. It not only contains 75 recipes but recommendations on pairing them with beer and cocktails. In 164 full-color pages, you’ll find some of the most creative and inspiring summer dishes. Continuing with the Mexican theme, the next kitchen tool is the Baking Blanket. It’s made from reinforced silicone and is safe for microwave, oven and freezer use. 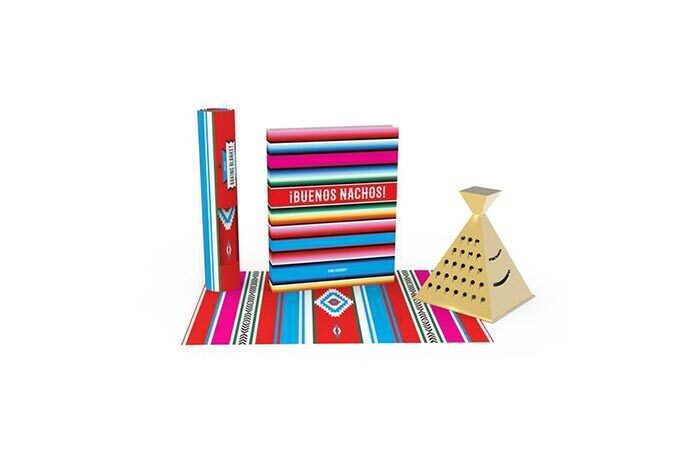 It perfectly fits a half-sheet pan and is designed with colorful Mexican textile prints. The last W&P Design kitchen item is a Nachos Grater. It’s super functional and maintains the classic grater shape. Each side is different and can provide several slicing functions. The construction features stainless steel plates and an ergonomic grip on top. This stylish titanium coated Set Of Knives has everything you need for chopping and slicing. In the set, you will find six knives: a chef, slicer, bread, Santoku, utility and a paring knife. The seventh part of the set is a black wooden holder. 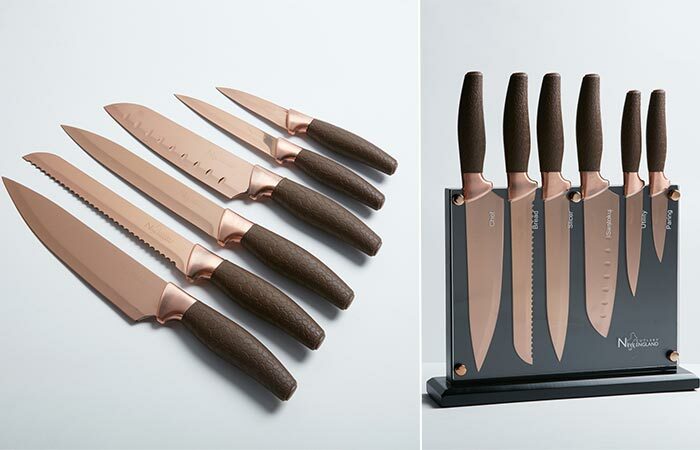 Knives feature a nonslip handle and rose gold titanium coated blades. They are corrosion and water resistant and very lightweight. We all know how popular the Mason jar is and that it has many redesigns. For instance, just recently we wrote about a cocktail recipe book written by the guys behind the famous Mason Shaker. This two piece Salt & Pepper Set will give your kitchen a vintage appeal and charm, not to mention it’s a necessity for every dinner table. 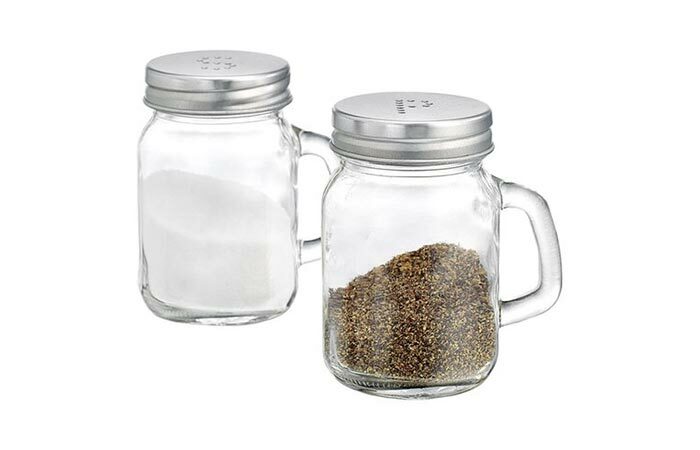 The jars are made from glass and metal and have 5-ounce capacity each. There’s a nice handle that will allow you easily season your meal. We’ve come to the last one on the list- a set from Old Dutch. This one not only provides a convenient storing space but is decorative as well. 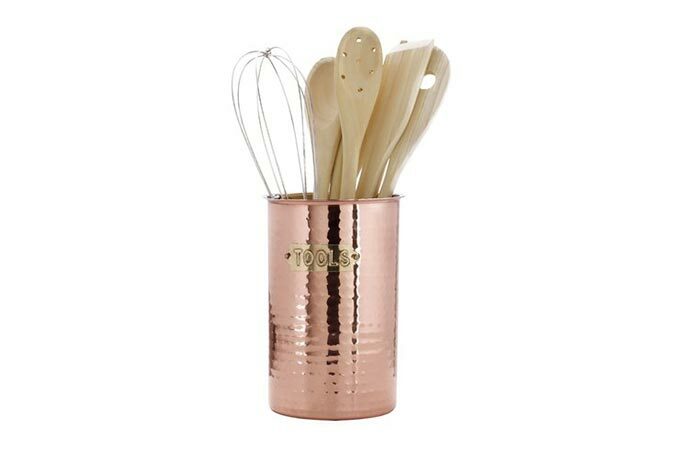 It includes a stainless steel container with a copper finish that can be easily washed. In it, you get a wire whisk, wooden fork, spoon skimmer, wooden spatula, 2 spoons, single hole mixing spoon and a straining spoon.